NO SPAM: This secure communications feature is provided for individuals and organizations to send Assyrian-related information. You agree not to send automated or manual SPAM, sales or any other form of advertisement messages. By clicking OK send this message, you agree to our guidelines and to be held responsible for your actions. This procedure may take several minutes to receive a confirmation message, depending on the size of the attachment file(s), if any, and the Internet connection. Thank you for your patience during this process. Search our Frequently Asked Questions, FAQs. The Assyrians of today are the indigenous Aramaic-speaking descendants of the ancient Assyrian people, one of the earliest civilizations emerging in the Middle East, and have a history spanning over 6760 years. Although the Assyrian empire ended in 612 B.C., history is replete with recorded details of the continuous presence of the Assyrian people until the present time. Assyrians are not Arabian or Arabs, we are not Kurdish, our religion is not Islam. The Assyrians are the indigenous Aramaic-speaking Christian people of the Middle East, with our own unique language, culture and heritage. What is the history of the word Assyrian? The English word “Assyrian” comes from classical Greek “Assurios” through Latin “Assyrius”; the Greeks borrowed it in the 8th century BC directly from the Assyrians, who at that time called themselves “Assurayeh,” originating from their capital city “Assur”. The Aramaic word “Athourayeh” was likewise borrowed from Assyrian, but earlier, in the 12th century BC, when the later “Assurayeh” was pronounced “Athourayeh” [the sound (th) shifted to (s) in Assyrian about 1100 BC]; still earlier, about 2300-1600 BC, the word had been pronounced “Ashur” and “Ashourayeh”. The initial syllable in “Assurayeh” was frequently dropped in the Neo-Assyrian period (900-600 BC), so that “Assurayeh” also had a variant “Surayeh,” which the Greeks took over as "Surios" (the English equivalent being Syrian). There was originally no difference in meaning between Assurayeh/Surayeh and Assurios/Surios; both meant the same thing. The self-designations of modern Assyrians, Sūryōyō and Sūrāyā, are both derived from the ancient Assyrian word for "Assyrian", Aššūrāyu. What is this website's perspective on our 'name' issue? We support an academic viewpoint which defines Assyrians as the national title of our people, as referenced in the Assyrian History Timeline and other online projects and websites. What is the best way to share and promote this website's information? I have a forum question. 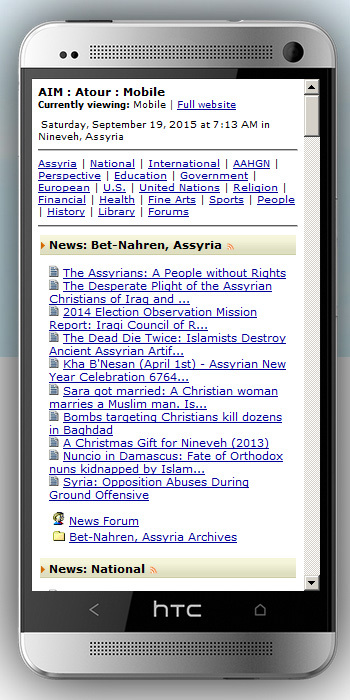 Please browse the Assyrian Forums Help section for frequently asked questions. I have a search question. 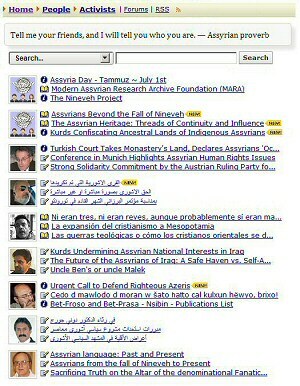 The Assyrian Information Management (AIM) Search feature located on the main page of atour.com and other website sections has an extensive search capability and can help you find documents on this website and related websites. The most relevant content will appear at the top of the search results. Click on this search link for more information and then type in your keyword(s) or phrases (within "quotes"), in the search box to start your search. 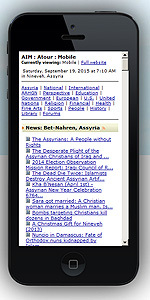 For example: searching for assyrian aid society without quotes, will display many results since assyrian appears in most documents on this website. 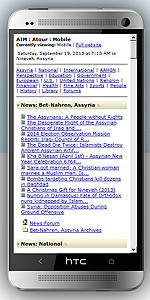 For better results, search with quotes included: "assyrian aid society"
I'm an activist and would like to publish my materials (articles and images) on this website. We look forward to working together with you within this online community. To effectively collaborate on projects, we require activists (including ourselves) to register and post information within the various categories of the Assyrian Forums. Additionally, you can also send us information through this contact form. We prefer Open Document files and accept the following attachments. JPG, PNG, and other attachments. I'm searching for the online dictionary to translate some English words to Aramaic and vice versa, where is it located? 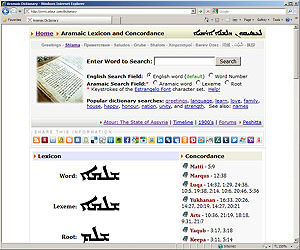 The Aramaic Lexicon and Concordance (Aramaic Dictionary) is located in the "Education" section, the main page, and other areas where the link "Shlama" appears (check the greetings above). This online Aramaic dictionary contains over 72,000 words. After you click on the link above, use the "Help!" section to learn how to install the Estrangelo font which will allow you to properly view the Aramaic words in the dictionary. Does this website have RSS feeds? Yes, the RSS feeds are available here. Does this website have a Facebook page? Due to SPAM, management, and security concerns, this website does not subscribe to social networking websites such as Facebook or Twitter. However, we do support sharing and social networking. We have made this website's documents easier to share with family, friends, and colleagues by having social sharing links within them. Documents have the green-colored "Open Share" icon appearing on the top of the pages, that when clicked, will scroll directly to the end of the page to the social sharing links. Do you have Assyrian fonts? A collection of Aramaic (Syriac) fonts can be downloaded for FREE from here: https://www.atour.com/fonts. To properly display the Aramaic (Syriac) fonts and documents on this website, download and install the following recommended font, (Estrangelo Version 1.1) as used on https://www.atour.com. For font installation help, view the online Aramaic Dictionary help section. I'm trying to find information about a recent event, where can I find it? We recommend information be sent through this contact system to ensure we receive your email message and permission to publish or re-publish your information to promote further awareness. 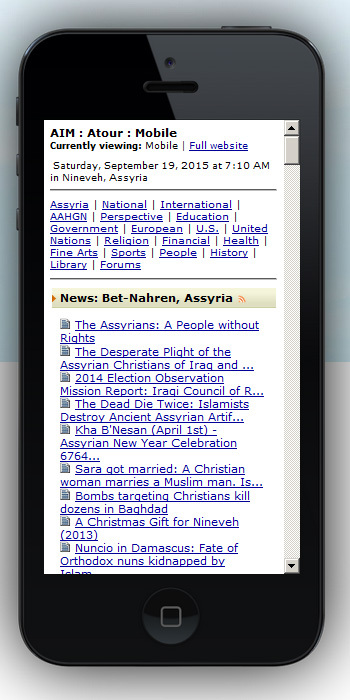 View the Assyrian Calendar for the latest events, or, search this website to find information. If the event is not in the calendar, then we have not received any information through this contact form. We recommend contacting the source of that event and suggest using this website's resources to bring further awareness to important projects and events. Additionally, we highly recommend posting your community news, events, and photographs at the Assyrian Forums to bring further awareness to important information. I have a mobile phone or portable digital assistant (PDA) which I use to access the Internet, is there a section on this website which can be viewed on my phone? Yes, a section was developed specifically for mobile users. Simply enter the website URL address (www.atour.com) into your phone's Internet browser program (Firefox, Chrome, Safari or others) and your phone will be automatically forwarded to the mobile section and will display this website's latest updates. Can I add my website link? We highly recommend adding your website into the FREE Assyrian Directory to help in promoting your website specifically to Assyrians. 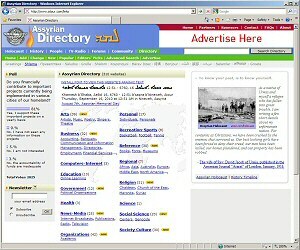 After your website has been successfully added in the Assyrian Directory, it will also be made available to our main search engine. Thus, there will be three new ways of visitors finding your website. Click on Add to add your website's information. 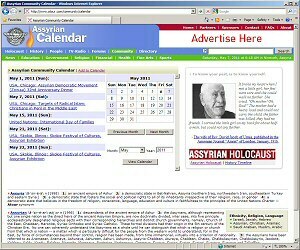 We would like to volunteer and write, edit or publish pages for the Assyrian History Timeline and other areas of the website, how is the publishing process of this website? To effectively collaborate on projects, we require volunteers (including ourselves) to register and post information in the Assyrian Forums, history and other forum categories. We are requesting permission from this website to reprint or cite some of the material to be published in our media (website, television, radio) which we deem of interest and importance to our Assyrian community. 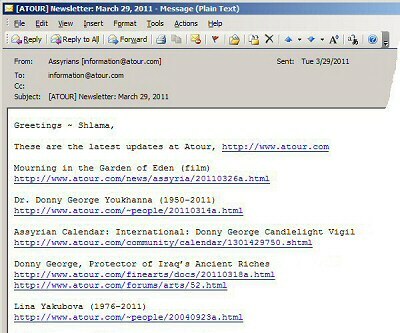 The information in this website (www.atour.com) is in the Public Domain or Creative Commons, unless otherwise stated as copyrighted by other respective companies, organizations or individuals, and can be reproduced without permission from atour.com. We respect copyright laws and believe in the fair use of copyrighted work for the purposes of news reporting, teaching, scholarship, research and preservation. Please make a link from your website pages to this website and use the public domain information in your media programs, publications, websites, radio or television programs to bring further awareness to the plight of the Assyrian nation. For detailed information, please view our Terms of Service information. I need someone's email address, can you send it to me? We do not share email addresses or lists with any organization, company, and/or individual. Email addresses and correspondences are considered private and confidential material. 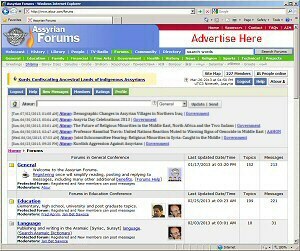 As an alternative, if your interested in sending and receiving private messages, register in the Assyrian Forums. Registered members have the ability to send and receive private messages with each other by using this system. Your email address is never shown and remains confidential to protect you from SPAM messages. This communications feature allows other registered people within the Assyrian Forums to privately and safely contact you online. My friends and I would be honored to be added to your mailing list, could you please add our email addresses? The Atour Newsletter Subscription Center is a mailing list system which allows us to send the Atour Newsletter on a monthly basis to people who have registered their own personal email address with our website. To subscribe or unsubscribe, please visit the free Atour Newsletter Subscription Center. How can our company or organization advertise on the Atour website? There are two options available for Assyrian individuals, organizations and corporations interested in advertising on this website. How often does my advertising banner appear on the website? The advertising banners of our partners and sponsors are given higher priority placements on our advertising system. The banners will be shown more often than affiliate advertising banners. When your advertising banner is updated on the system, we will send you an email message with login information (URL, username and password) to access and view the current statistics of your advertisement. This website had an inspirational starting page when I first visited in 1997, is that web page still available? Founded on December 10, 1996, website development began and on September 06, 1997, atour.com went online. The original web page has been preserved here for posterity. How can I help this website?